As expected, yesterday in India, an official event took place, which featured a line of Samsung Galaxy M smartphones. It included two models – the M10 and the M20. Contrary to the rumors, the Galaxy M30 was not announced. Galaxy M is focused on millennials – during the presentation, this word sounded, it seems, at least hundreds of times. They are provided with special tariff plans for Internet traffic at special prices – they, by themselves, only work when buying with a smartphone, just to connect advantageous tariffs will not work. Millennials with a small amount of money will buy the younger model of the Galaxy M10 line. It is equipped with a screen of 6.2 inches with a resolution of 1480 × 720 pixels, a dual camera with an image sensor with a resolution of 13 and 5 Mp (the lens aperture of the first module is F / 1.9 inches, the second – F / 2.2) and one-chip Exynos 7870 platform with an octagonal 1.6GHz CPU and the Mali-T830 GPU. The minimum version is 2 GB of RAM and 16 GB of flash memory, in the top 3 GB of RAM and 32 GB of flash memory. Also, in the configuration of the smartphone, the front camera with a resolution of 5 MP with an aperture of F / 2.2, a fingerprint scanner on the back panel, a battery pack of 3400 mAh. Dimensions and weight of the model 160.6 × 76.1 × 7 , 9 mm, weight – 163 grams. Galaxy M20 and more, and more powerful if you compare SoC. It has a 6.3-inch diagonal display with a resolution of 2340 × 1080 pixels and was recently announced by SoC Exynos 7904. The amount of RAM is also larger, 3-4 GB, the amount of flash memory is 32 or 64 GB . The capacity of the battery is quite different – 5000 mAh. There is also a USB-C port. The dimensions and weight of the Galaxy M20 are 156.6 × 74.5 × 8.8 mm and 186 grams. The Galaxy M10 and Galaxy M20 are equipped with standard headphone jacks and run Android 8.1 Oreo with the Samsung Experience 9.5 interface. But for these models, the update has been upgraded to Android 9.0 Pie. Sales of new products will start in India on February 5, prices have already been announced. 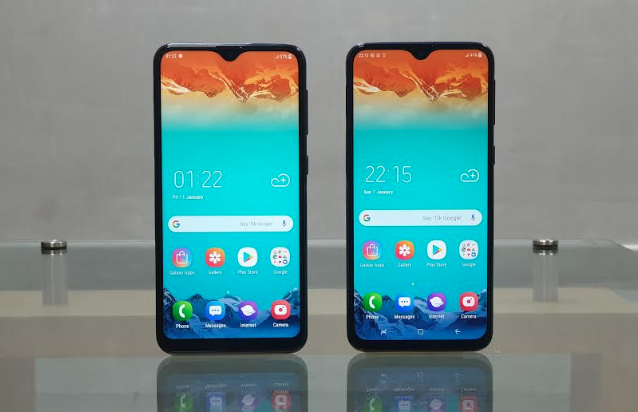 The base version of the Galaxy M10 is estimated at $ 112, the price of the version with 3 GB of RAM and 32 GB of flash memory – $ 126. Galaxy M20 is more expensive: $ 155 for a variant with 3 GB of RAM and 32 GB of flash memory or $ 183 for the version with 4 GB of RAM and 64 GB of flash memory. There are two variants of color registration in the models: blue and black.